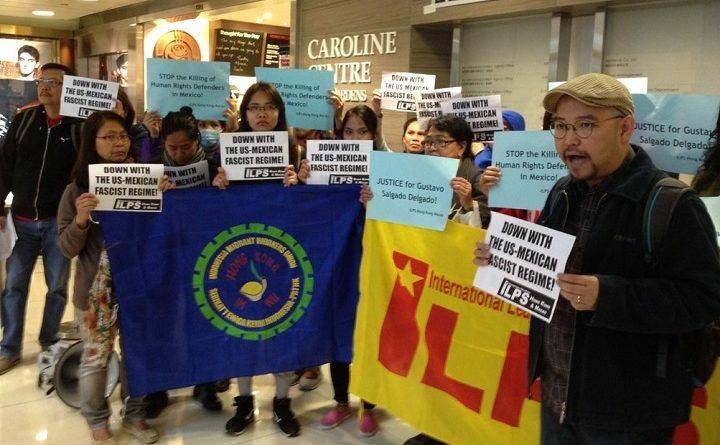 The International League of People’s Struggle – Hong Kong and Macau chapter (ILPS-HKM) condemns the abduction, torture and brutal murder of Mexican activist, Gustavo Salgado Delgado. We stand with organizations around the world that are calling for justice for Delgado and all victims of suppression of people’s rights largely perpetrated by state forces. On February 4, Gustavo’s heavily-tortured and murdered body was found after he was forcibly disappeared the previous day. Gustavo was a state leader of Frente Popular Revolucionario (FPR) in Morelos and was a member of the Executive Committee of the Central Committee of the FPR. He was a dedicated and energetic leader and was determined to build the FPR in the state of Morelos. Because of his political activities, Gustavo has been a target of powerful classes and the state forces that protect them. He was resolute and militant in defending the people’s right to the land and demanded provision for the needs of the working people in the municipality of Ayala, especially the migrant workers from the mountainous areas of Guerrero and Oaxaca. While participating in the people’s march on March 20, 2014, he was forcibly arrested and illegally detained in Cuernavaca, Morelos. Gustavo’s death has triggered a wave of protests in Mexico calling for justice for Gustavo and against the use of various forms of violence by the Pena Nieto government to suppress the people’s struggle for a better life. The economic, political and social crisis affecting Mexico, due to imperialist neoliberal globalization policies, has remained unabated with worsening impacts to the marginalized people including workers, peasants, migrants and indigenous people. Criminal operations by syndicates including drugs and human trafficking run rampant with the alleged connivance of local authorities. The crisis pushes more and more people to migrate especially to the US, and risk life and limb just so they can seek better opportunities for a decent life. While in transit, many of them fall victims to traffickers, succumb to the hardships that characterize migration to the US, or get caught in the increased security measures against migration by the US government. Such condition of abject poverty, displacement, dislocation, unemployment and severely lacking social services are the bases why the Mexican people are rising up to push for revolutionary changes. But as shown by the case of Gustavo, this resistance is met with brutality and human rights violations. We call for justice for Gustavo and we want it now. We call for justice for all victims of state fascism and we want it now. We stand with the call for comprehensive and long-lasting changes and we want them now. ← Justice for Gustavo Salgado!